I think it was Tuesday night. Josh and I were sitting on the couch as we witnessed the event. It was down to the wire. Both characters were down to their last ounce of life and I feared the worst. I hid my head in my hands because I just couldn't watch. The anticipation of what might happen was getting the best of me. Josh stayed strong, he kept encouraging. Then it finally happened. One last swing of the light saber and it was over. I didn't dare look up from hiding my face...but I had a feeling that the outcome was a good one. It was. 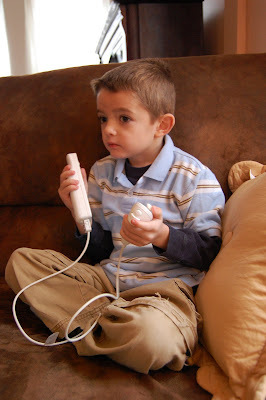 At this moment Ethan (our 5 year old) was able to enjoy the feeling that comes with beating a video game...The Force Unleashed for the Wii. He has played many games but he has never played a game from beginning to end until this day. He worked hard for it. Darth Vader gave him a run for his money..but Ethan overcame him. It was down to Ethan and the Emperor (I think?) and again, was having a hard time. He even had to pause the game to get his composure as he was getting a bit frustrated. Josh cheered him on as he tried again. It took quite a long time..but he did it, without a single bit of help from anyone. I'm not even sure if he knew that the Emperor was last guy. In fact, it was interesting to see the look on his face when he saw the credits of the game. It was one of both excitement and disappointment because the game was over. I have felt that feeling..and Josh (being the bigger gamer around here) has definitely felt that way too. You work so hard to beat a game and then to have it be over so quickly is quite anti-climactic, but then you remember the feeling of satisfaction of having conquered a game and its ultimately a happy feeling. Ethan was excited to see what new things he'd unlocked and then realized he could play through the game as a different character. I think only gamers (or wives of gamers) can completely understand the excitement of events like these:) It was quite the event around here!